The City of Laredo, Texas is not only the gateway to Mexico, but the gateway to the U.S. from almost everywhere else. Since the inception of NAFTA (North American Free Trade Agreement) and the GATT (General Agreement on Tariffs and Trade), Laredo and Nuevo Laredo (which some refer to as the Mexican half of Laredo) have seen the advantages and disadvantages of being the southern U.S.’s largest inland port. Have these large scale changes affected the City’s waste flow? You bet. And the by-products of free flowing trade across the Rio Grande are not always pretty. To say that Laredo, TX is a busy border town is an understatement. The massive flow of traffic– goods and people- – from one side of the river to the other, and in both directions, is an WasteExpo: Visit us at booth 8022! Dallas, TX May 18-20 everyday event for the residents of both Laredo and Nuevo Laredo. Lined up, sometimes for miles in each direction, vehicles are loaded with everything from avocados to televisions. In fact, 40% of all trade between the U.S. and Mexico flows through Laredo, which, according to the City’s website (www.cityoflaredo.com), is now listed in the top twenty fastest growing cities in the country. Laredo’s status as a gateway to Mexico is really nothing new. Geographic proximity to an old Indian river crossing, the arrival of the railroads in the late 1880’s, and the influx of emigrants from Mexico during the Mexican Revolution (1910- 1920) have all contributed to Laredo’s historic development as a intra-national thoroughfare. More recently, the introduction of trade agreements such as the GATT and NAFTA treaties have served to dramatically expand the flow of goods and people by decreasing trade restrictions and lowering tariffs. This dramatic increase of trade has meant more change for one city than they could have ever imagined. In the last ten years, there has been a drastic increase of vehicles across the city’s two international bridges. According to the City of Laredo Bridge System’s statistics, over 8.4 million commercial and noncommercial vehicles crossed into Mexico and beyond in 2003. Though the reduced trade restrictions have led to an increase in trade between the U.S. and Mexico, this is still an international border crossing, which means vehicles must stop before crossing. The bottle neck that has resulted only temporarily slows the flow of traffic, but has been the real source of impact for Laredo’s booming economic growth. Some might call this a false economy, one that could disappear with more lenient border security and a greater number of routes across the river, but the fact is that Laredo is now becoming the distribution center for the cargo that makes it’s way from one country to the other. Few would argue that Laredo was better off before the free trade boom, but there is always a cost, and it isn’t too hard to see. In fact, it is flying overhead and its even in the air. The large number of flights bringing cargo to and from Laredo, the exhaust from miles of slow moving trucks and trains waiting to cross the border, and the addition of millions of square feet of storage space and warehouses are some of the more obvious sights and sounds of growth in the region. The residents of this area have had to learn to live with their new industrial surroundings, remembering that without the traffic and the noise there would be fewer jobs, schools and successful new businesses. Without the economic benefits of tourism or other viable industry, they have little choice but to embrace the fate that this free trade boom has brought them. Inevitably, the business of free trade yields waste. Of the millions of tons of cargo that makes its way to Laredo and Nuevo Laredo, not all of it makes it any further. Here at the border is where various government agencies, such as the Department Homeland Security, the U.S Department of Agriculture, the Food and Drug Administration, and the Drug Enforcement Agency have their army of inspectors in place to determine what goods legally qualify for export and import. Because of the increased volume of traded goods, it has become more difficult to thoroughly inspect every load, and more inviting for those trying to profit from slipping through. Contraband is a big problem. From fake Nike shoes to unlicensed Disney clothing, the U.S. government inspectors have their hands full trying to keep these products out of the country. And it’s not just shipments to the U.S. Shipments from the U.S. to Mexico are under the same level of scrutiny. “Poultry and produce are often stopped and turned away due to spoilage or quality issues”, according to Randall Kippenbrock, Landfill Manager for the City of Laredo. And he should know, since his landfill sees a fair share of these trade rejects. As shipments are stopped and inspected, the materials that fail to meet the standards for one reason or another must be disposed of or destroyed. Counterfeit clothing and shoes can sometimes be shredded on the spot, but other items must be destroyed or sent to a landfill. 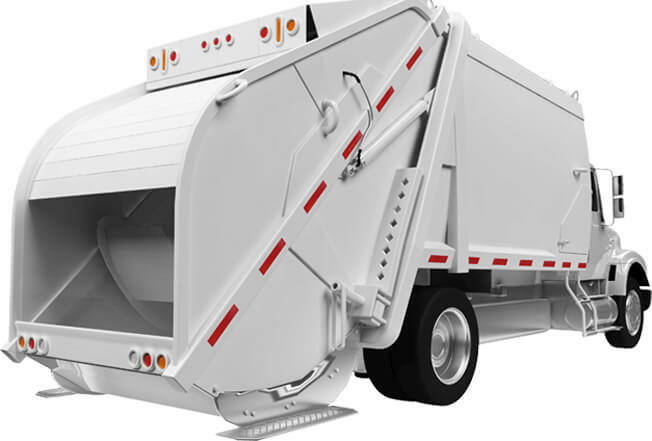 Items to be disposed at the landfill are closely monitored for complete destruction, which helps eliminate the risk of scavenging. Higher tipping fees for foreign and out of county materials, “particularly for loads from Mexico”, says Kippenbrock, have kept the Laredo landfill from becoming inundated with the entirety of this trade waste, but they do see some of it. Expired beverages, spoiled meat and vegetables, damaged or infested cargo, and even some loads of stolen goods en route to the safety of Mexico from the States, often get re-routed to the Laredo landfill.